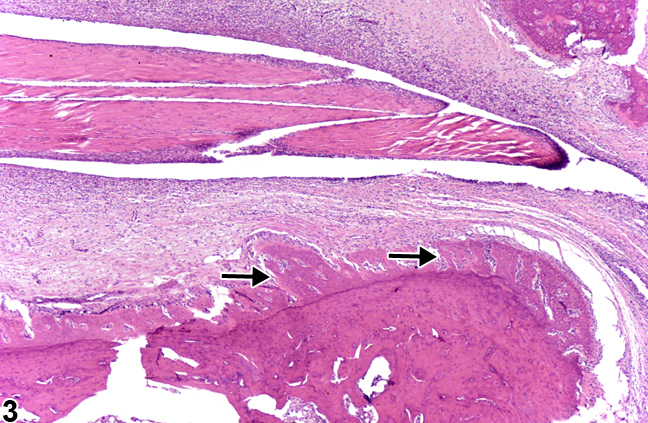 Bone - Inflammation, Chronic in the bone of a male F344/N rat from a chronic study. Bone resorption is associated with inflammation. 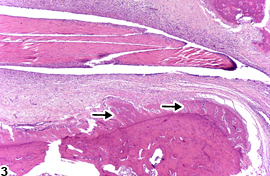 Bone - Inflammation, Chronic in a male B6C3F1/N mouse from a chronic study. Inflammatory cells surround a piece of bone that is undergoing resorption (sequestrum). Bone - Inflammation, Chronic in a male F344/N rat from a chronic study. Reactive bone is arranged in an orderly pattern, with bony trabeculae arranged perpendicular to the adjacent mature cortical bone (arrows). Inflammation of the bone (osteomyelitis, osteitis) is uncommon in the B6C3F1/N mouse and F344/N rat. In rodents, inflammation of the bone is typically due to bacterial infection as a result of trauma, such as penetrating wounds or fracture, otitis media, or sinusitis. Inflammation of the periosteum (periostitis) and adjacent bone may occur in regions subjacent to ulceration of the skin and is often associated with reactive bone proliferation and granulation tissue. In many cases, inflammation of the bone (especially associated with staphylococcal infection) is associated with marked localized bone resorption ( Figure 1 and Figure 2 ) due to bacterial factors and increased osteoclastic activity, as well as regional reactive and hyperostotic bone response at the lesion margin as an attempt to localize the inflammatory process. 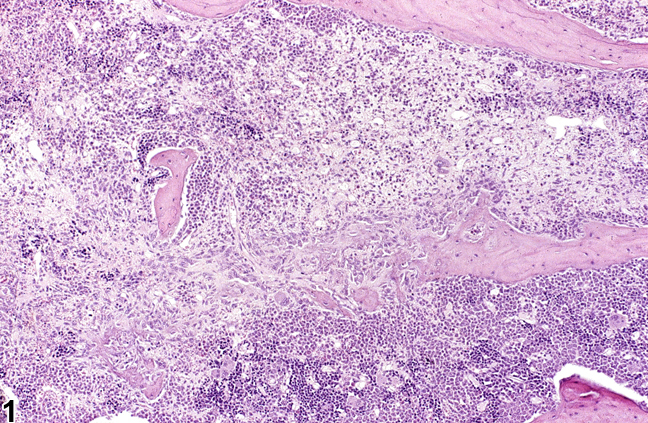 Distinguishing hyperplasia of reactive bone and remodeling processes from an underlying neoplasm often may be difficult. In contrast to neoplastic bone, reactive bone is arranged in an orderly pattern, with bony trabeculae arranged perpendicular to the adjacent mature cortical bone and parallel to each other ( Figure 3 ). In reactive bone, osteoblasts are regularly interspersed along the surface of trabeculae. The type of inflammation in bone may depend on the cause and chronicity. In NTP studies, there are five standard categories of inflammation: acute, suppurative, chronic, chronic-active, and granulomatous. In acute inflammation, the predominant infiltrating cell is the neutrophil, though fewer macrophages and lymphocytes may also be present. There may also be evidence of edema or hyperemia. The neutrophil is also the predominant infiltrating cell type in suppurative inflammation, but the neutrophils are aggregated, and many of them are degenerate (suppurative exudate). Cell debris from the resident cell populations and infiltrating leukocytes; proteinic fluid containing fibrin, macrophages, lymphocytes, and/or plasma cells; and possibly an infectious agent may also be present within the exudate. Grossly, these lesions would be characterized by the presence of pus. 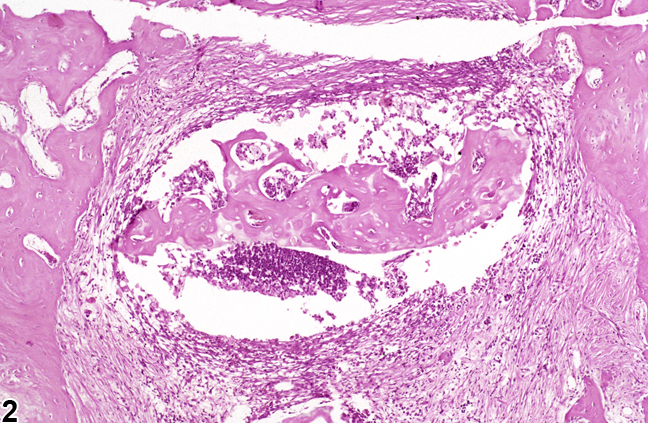 In the tissue surrounding the exudate, there may be fibroblasts, fibrous connective tissue, and a mixed population of inflammatory cells, depending on the chronicity of the lesion. Chronic and chronic-active inflammation is determined by the presence of fibroblasts or fibrosis. With chronic inflammation, the predominant inflammatory cell is usually the lymphocyte, whereas chronic-active inflammation has a mixture of lymphocytes and neutrophils. 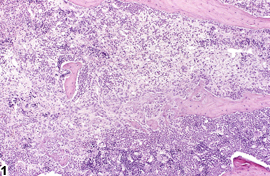 Both lesions may also contain macrophages. However, it is the presence of fibroblasts or fibrosis that determines the chronic nature of the lesion. Granulomatous inflammation is another form of chronic inflammation, but this diagnosis requires the presence of a significant number of aggregated, large, activated macrophages, epithelioid macrophages, or multinucleated giant cells. In cases in which a bacterial infection becomes established in the bone, suppurative inflammation and necrotic cellular debris are often localized as an abscess or sequestrum in an attempt to wall off the inflammatory/infectious process ( Figure 2 ). Inflammation of the bone is not typically observed as a response to toxicologic exposures in routine toxicity and carcinogenicity bioassays under Good Laboratory Practice conditions. However, if increased incidences of osteomyelitis are observed, this may indicate issues with animal husbandry. In addition, any compound causing profound immunosuppression may impact an animal’s ability to respond to commensal pathogens, thus increasing susceptibility to infection. Inflammation of bone should be diagnosed and given a severity grade. The character of inflammation (suppurative, granulomatous, etc.) should be part of the diagnosis. If inflammation of the bone is observed in conjunction with a primary traumatic injury (e.g., fracture, penetrating wound) or primary bone tumor, it should not be diagnosed but should be described in the narrative as a component of the primary lesion. However, in cases in which chronic inflammation has led to marked bony resorption and osteopenia with secondary fracture, inflammation should be recorded as the primary diagnosis, with a description of the secondary effects of marked bone resorption provided in the narrative. When recognized in concordance with other systemic inflammatory lesions, especially suppurative lesions (abscesses), the spectrum of lesions as a systemic condition should be recorded and described in the narrative. If inflammation of the bone is associated with treatment, the bones affected should be identified in the pathology narrative. Cremieux A, Carbon C. 1997. Experimental models of bone and prosthetic joint infections. Clin Infect Dis 25:1295-1302. Leininger JR, Riley MGI. 1990. Bones, joints, and synovia. In: Pathology of the Fischer Rat: Reference and Atlas (Boorman G, Eustis SL, Elwell MR, Montgomery CA, MacKenzie WF, eds). Academic Press, San Diego, 209-226. Nair SP, Meghji S, Wilson M, Reddi K, White P, Henderson B. 1996. Bacterially induced bone destruction: Mechanisms and misconceptions. Infect Immun 64:2371-2380. Nair S, Song Y, Meghji S, Reddi K, Harris M, Ross A, Poole S, Wilson M, Henderson B. 1995. Surface-associated proteins from Staphylococcus aureus demonstrate potent bone resorbing activity. J Bone Miner Res 10:726-734. Vaes G. 1988. Cellular biology and biochemical mechanism of bone resorption. A review of recent developments on the formation, activation, and mode of action of osteoclasts. Clin Orthop Relat Res 231:239-271.